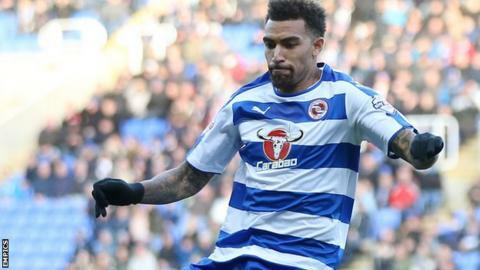 Bolton slipped to the bottom of the Championship after Danny Williams' first-half strike gave Reading victory. The spirited visitors started brightly but their former goalkeeper Ali Al-Habsi denied Shola Ameobi, Mark Davies and Darren Pratley. A defensive error then saw Lucas Piazon put the Royals ahead before Williams fired low into the net from 25 yards. Liam Feeney's 80th-minute penalty made it 2-1 but the hosts held on. Reading's win came a day after manager Steve Clarke had committed his future to the club following interest from Championship rivals Fulham. It looked like it could be a frustrating day for the hosts with Ameobi having a header saved by Al-Habsi early on before the Royals' keeper then blocked a Davies effort. The Oman international then pulled off a third crucial save to keep out Pratley's header. Those three interventions proved vital as Reading's patience was rewarded when a defensive mistake saw Piazon block the attempted clearance of Prince-Desir Gouano before lifting the ball over Ben Amos and into the empty net. That goal seemed to change the momentum of the game as, after Oliver Norwood tested the palms of Amos, Williams then struck a low shot from 25 yards to make it 2-0 at the break. Bolton started the second half in similar fashion to the first as Ameobi again went close, this time hitting the crossbar with another header. Amos then did well to deny Nick Blackman, tipping his volley over the bar before Williams volleyed wide at the other end from outside the box. And, just moments later, Bolton reduced the deficit through Feeney's penalty after Pratley was brought down in the box by Norwood. "It was always going to be a little bit strange for me today, but I've got to say that the crowd got it quite right. "The reception was cool but nothing more than that. And they got right behind the team, which is all we ask for. I don't think the Fulham talks had any effect on the players. "The result was good in the context of our season. We're desperate to stay in and around the upper levels of the league and challenge for promotion. "It was a big win for us after five games without a win. It was really important to us today." "We could have been three goals up before we shot ourselves in the foot. Al Habsi's made three very good saves. "The goals we conceded, we just gave them to Reading. They didn't have to work hard for either goal. The first one was schoolboy stuff from our point of view. "We didn't look like a team at the bottom of the league but I've been saying that for quite a while now, but I've got to take positives from the defeat. There was a lot of good things that we did. "We just need a bit of mental strength at both ends of the pitch, which is lacking at the moment." Match ends, Reading 2, Bolton Wanderers 1. Second Half ends, Reading 2, Bolton Wanderers 1. Offside, Bolton Wanderers. Casado tries a through ball, but Emile Heskey is caught offside. Substitution, Reading. Matej Vydra replaces Nick Blackman. Offside, Reading. Nick Blackman tries a through ball, but Danny Williams is caught offside. Attempt missed. Gary Madine (Bolton Wanderers) header from the centre of the box misses to the right. Assisted by Liam Feeney with a cross following a corner. Corner, Bolton Wanderers. Conceded by Andrew Taylor. Attempt blocked. Casado (Bolton Wanderers) left footed shot from outside the box is blocked. Assisted by Liam Feeney. Attempt saved. Casado (Bolton Wanderers) left footed shot from outside the box is saved in the centre of the goal. Goal! Reading 2, Bolton Wanderers 1. Liam Feeney (Bolton Wanderers) converts the penalty with a right footed shot to the bottom left corner. Penalty conceded by Oliver Norwood (Reading) after a foul in the penalty area. Penalty Bolton Wanderers. Darren Pratley draws a foul in the penalty area. Substitution, Reading. Jake Cooper replaces Garath McCleary. Attempt missed. Danny Williams (Reading) right footed shot from outside the box is close, but misses to the left. Assisted by Michael Hector. Attempt blocked. Michael Hector (Reading) right footed shot from the centre of the box is blocked. Attempt blocked. Garath McCleary (Reading) left footed shot from outside the box is blocked. Assisted by Oliver Norwood. Corner, Reading. Conceded by David Wheater. Attempt missed. Danny Williams (Reading) right footed shot from the right side of the box misses to the left. Assisted by Garath McCleary. Corner, Reading. Conceded by Neil Danns. Substitution, Bolton Wanderers. Emile Heskey replaces Mark Davies. Corner, Reading. Conceded by Ben Amos. Attempt saved. Nick Blackman (Reading) right footed shot from the centre of the box is saved in the top right corner. Substitution, Reading. Jordan Obita replaces Lucas Piazon.